"A basic breakfast staple with a lower-calorie spin. 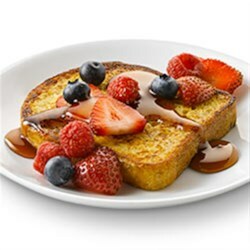 This French toast with mixed berries recipe contains 13% fewer calories and 50% less sugar than the full-sugar version." In medium bowl, beat milk, egg product, Truvia(R) natural sweetener, salt and vanilla. Pour into shallow dish; set aside. Heat nonstick griddle or nonstick skillet over medium heat or to 350 degrees F. (To test griddle, sprinkle with a few drops of water. If bubble jump around, heat is just right.). Grease griddle with butter as needed. Dip bread into egg mixture; coating each side of bread. Place on griddle. Cook 3 to 4 minutes on each side or until golden brown. Serve each slice with 14 cup berries and 1 tablespoon whipped topping. Drizzle with syrup.